I interrupt the King Arthur posts to bring you a blogger brunch. Back at our dinner at Villa Francesca, the crowd of us decided that we all loved brunch, and we should start a brunch club in the fall. 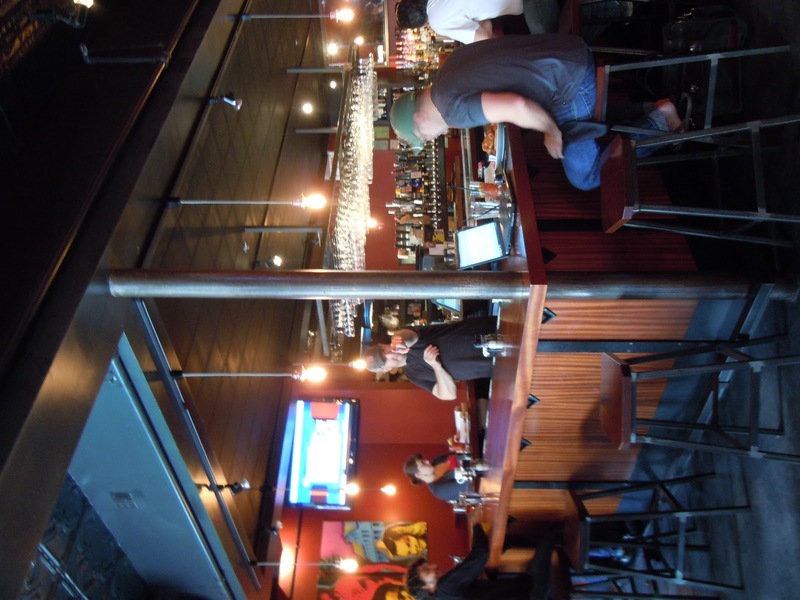 Renee from Eat Live Blog took the helm and organized our first event at Lord Hobo in Cambridge. Brunch is my favorite meal, but since I generally only eat it when I'm too tired and lazy to cook for myself, I tend to stay pretty close to my apartment so I can hurry home for a nap with a belly full of goodness. I rarely get to Cambridge for brunch, which is a shame - because there are a LOT of good brunch places on the other side of the river. 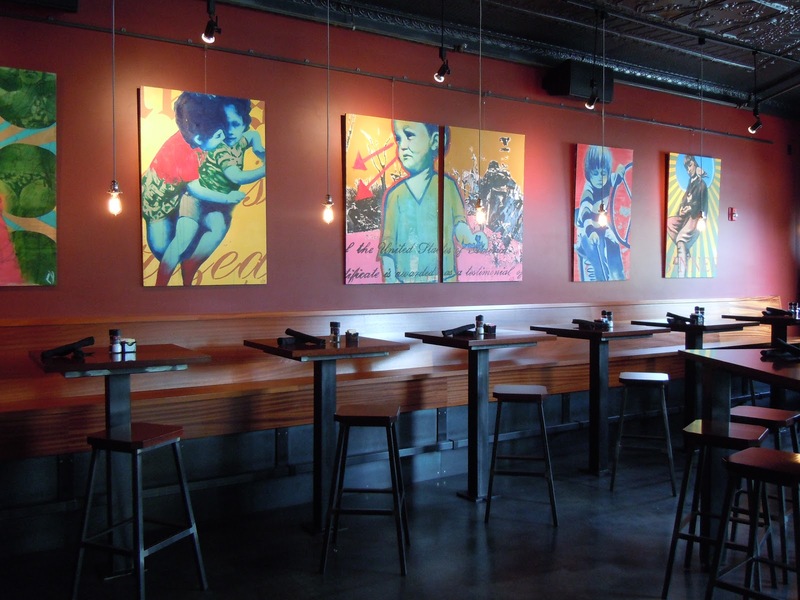 I really liked the atmosphere of Lord Hobo. It was much more relaxed than my usual back bay brunch haunts. 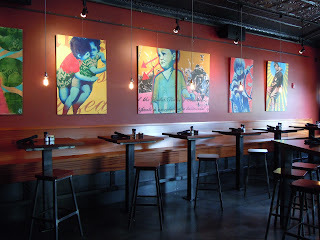 I loved the relaxed bar environment, the funky design, and the colorful & modern art on the walls. The menu included more choices than were featured online, so I perused it one more time to decide what I wanted. In the meantime, Rafe and I ordered a couple breakfast cocktails. A mimosa for me, a greyhound for him. And two large cups of coffee. Almost any time I go to brunch, I order the eggs benedict. I think it’s a good litmus test for a brunch joint. 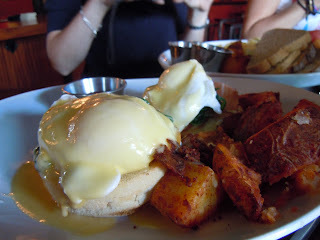 It worked at Lord Hobo too - There were some things they did well, like the hollandaise sauce. It was bright, lemony, but not thick or mayonnaise-like....and the addition of spinach and speck instead of the usual Canadian bacon just made me happy. One of my eggs was PERFECT-ly poached, while the other was hard in the middle. Normally I'd let this slide as an outlier, but a few of the other diners had the same complaint about their yolks. Potatoes needed a little work, but I will say, nice try Lord Hobo. Go a little lighter on the spice, a little smaller on the dice - and you've got yourself a winner. Rafe and I had eggs on Saturday for breakfast...He's got these weird food rules and doesn't like to eat eggs more than once in a weekend. But I told him if he ordered the fruit and yogurt I would make fun of him. So he ordered the egg sandwich with ham on a croissant. And he let me take a bite....for research. 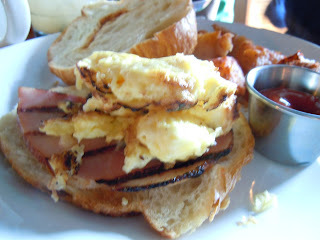 Pretty much your standard egg sandwich - it was pretty good, but nothing revolutionary. I don't know if I was just needing carbs or something though, but that croissant was delightful and flakey. We were sitting next to Megan and she let me score a bit of her hash. 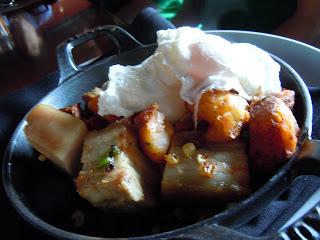 The pork belly was yummy, but I agree that the mixture should have been a little more uniform in size. And the egg poaching was a little less than stellar on this Sunday morning. All in all, I had myself a grand old time. It was great to catch up with the foodie gang after my trip....and they were pretty excited to finally meet Rafe. I think he was happy to find out that I've made such lovely friends through blogging....and that we aren't some group of weirdo food chatroom people. Thanks Renee for organizing!! Can't wait for the next blogger brunch!! I could be a weirdo food chatroom person and you just don't know it yet! Just kidding. 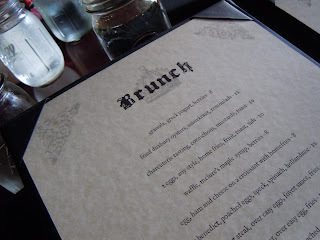 If you ever need a Cambridge brunch buddy, you know where to find me! wait, i thought we were a group of weirdo chatroom peeps?! I posed my review tonight as well! yay. So glad I got to meet Rafe! Love the pic of you two sipping the bfast cocktails! Do you like Johnny D's brunch? That's my fave! Have a great day!! I thought the best line of this blog post was "Go a little lighter on the spice, a little smaller on the dice" until I got to "group of weirdo food chatroom people". You crack me up lady. SO glad to finally meet Rafe! Melissa - you should follow us on twitter @bostonbrunchers!